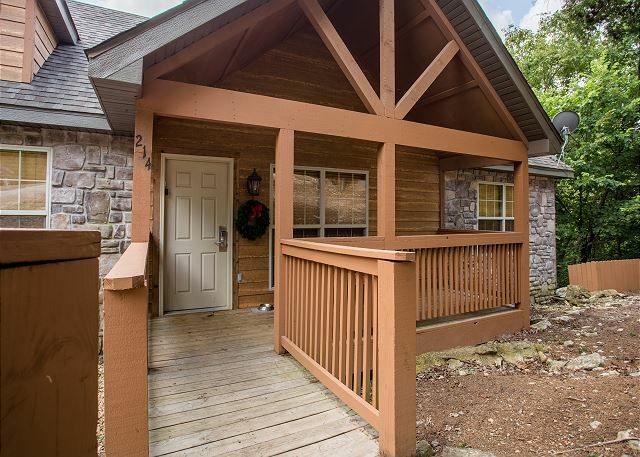 The path to your perfect vacation is in sight when you rent this enchanting 2 bedroom vacation lodge in the heart of the Ozarks! 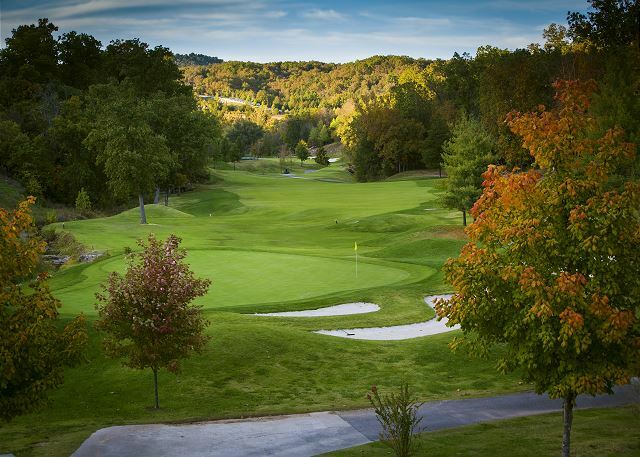 Come enjoy the scenic beauty of Branson by staying at Stonebridge Resort, a fantastic retreat for anyone who appreciated the flora and fauna that the area provides. 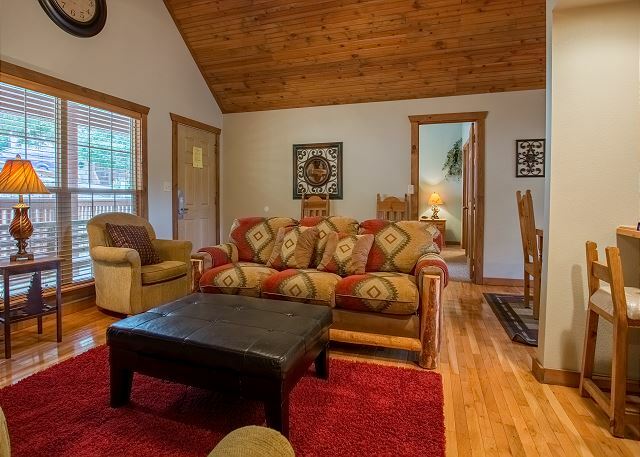 This private lodge is your center of relaxation, and it provides all the comforts of home at a perfect price point. Two separate bedrooms give everyone the space they need to spread out and get cozy. 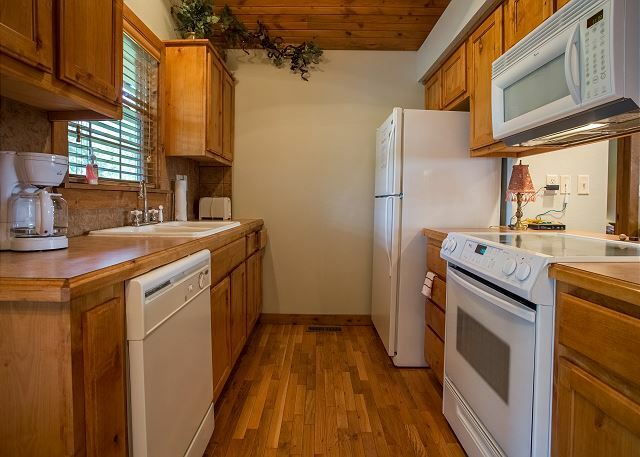 You have your own full kitchen, allowing you to whip up some tasty meals when you see fit. 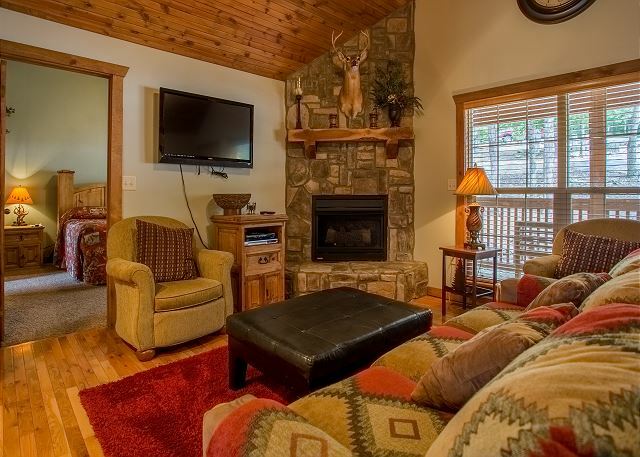 When all is said and done, move into the living area and sit down beside the roaring fire as you catch up on your favorite shows or just discuss your fun-filled days in Branson! And fun is aplenty when you vacation in Branson. Take a short drive to Silver Dollar City and enjoy some exhilarating rides with family-friendly attractions, or head to Table Rock Lake and make a splash under the sun! 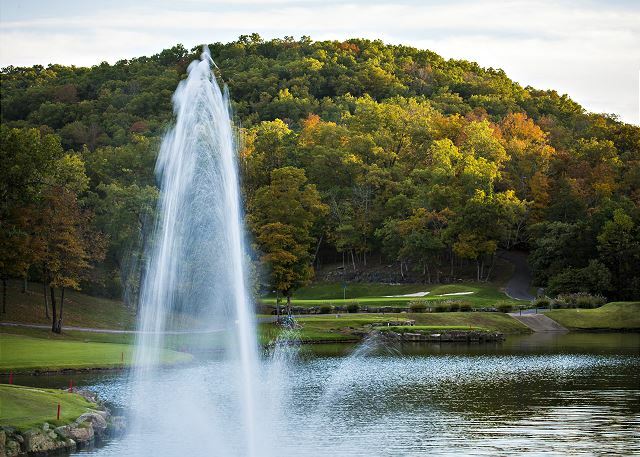 There are a million ways to spend a day in the Ozarks, each one offering plenty of memories that will last a life time! We loved this little cabin. It was a perfect size for our family of 4, clean and well stocked. 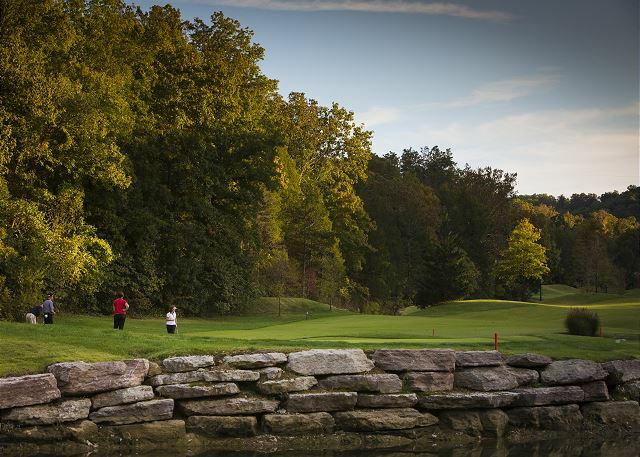 The view of the stream and golf course were great too. 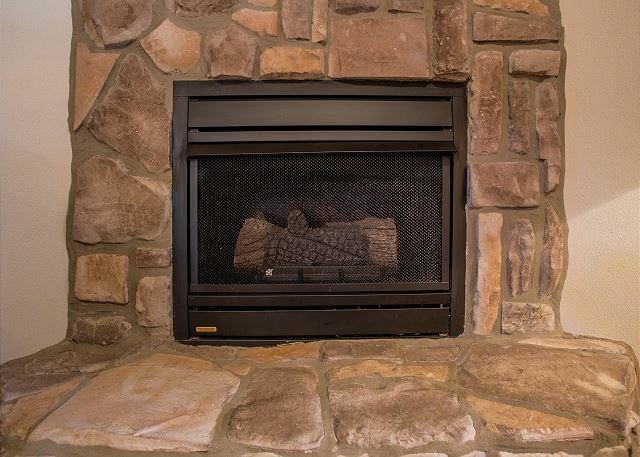 We really enjoyed our morning coffee on the screened in porch, and the gas fireplace was nice in the evening.This is a great location if you&#x2019;re planning on spending time at Silver Dollar City, it is a little bit of a drive to get to town, but that wasn&#x2019;t necessarily a draw back to us. We really enjoyed the quiet and scenic drive. We were a little disappointed with the bedding and mattresses. Both could use an update. Our backs got pretty sore, and the blankets were the old polyester quilts you&#x2019;d expect in a dated hotel. This was really our only complaint, and we were otherwise very impressed with the entire experience.Also, I can&#x2019;t remember the name of the gentleman I spoke to on the phone when we changed our reservation, but he was so helpful and patient with me. I&#x2019;d like him to be recognized for his great customer service. We had a wonderful stay in Peaceful Path cabin! It is a very nicely decorated and cozy cabin. It is a little distance outside Branson, but the drive is not bad at all. 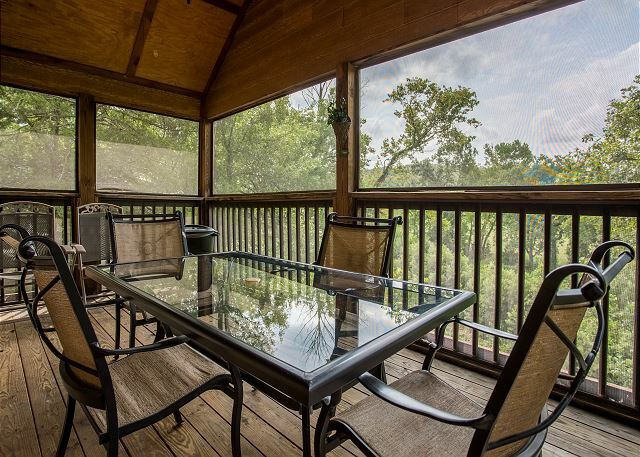 I especially enjoyed the screened in deck-a quiet, peaceful place to enjoy your morning coffee. We really enjoyed our stay! The cabin was perfect, just as pictured. 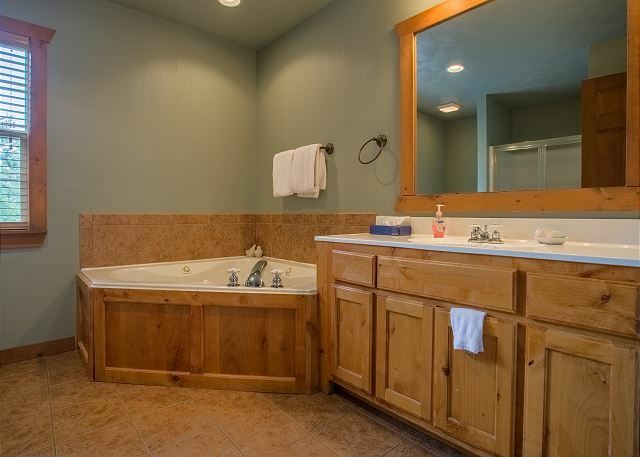 Very clean and well kept in a beautiful location. 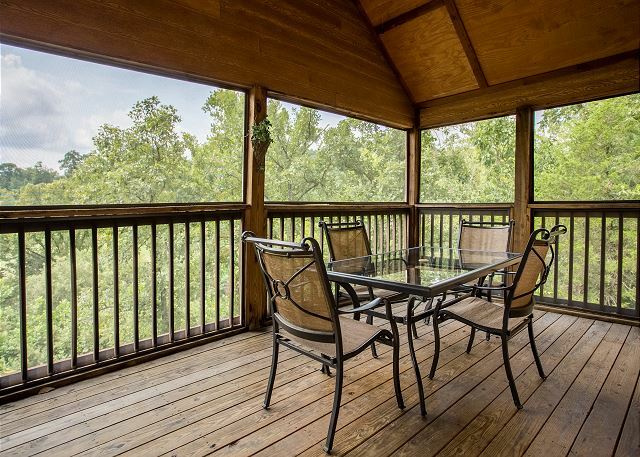 The deck overlooking the wooded area was so peaceful. We would highly recommend this cabin! We had never been to Branson and the rental agency was so helpful and informative. The cabin was very clean and comfortable as expected. The walkway leading to the front door was steep and difficult when walking with a cane. The middle railings were loose. The tree limbs over the walkway were very low making the walkway more difficult to manage. This cabin is excellent for those who do not have walking issues. We are glad to hear that you had a comfortable stay, Jerry. However, we are also sorry about those few inconveniences you experienced. We will look into making some improvements! You are our priority, and we want to ensure that your stay with us is a close to perfect as we can make it! 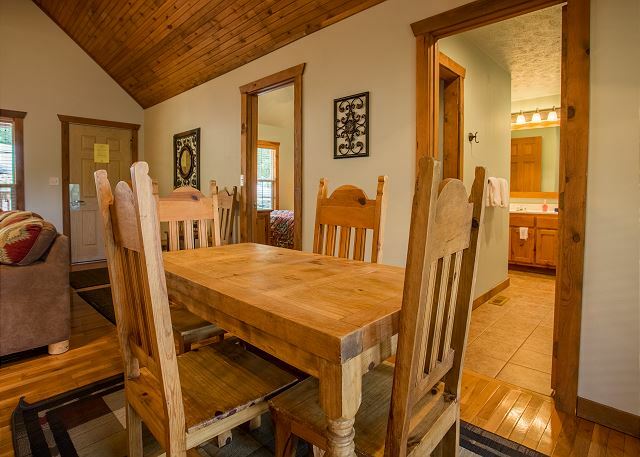 The property is exactly as depicted in photos! Nice quiet area backing up to small creek with golf course on other side. If you are looking for a quiet, relaxing getaway this is the place. Liked it so much already checking about coming back! Thank you Karen for the awesome review! Be sure to mention on your next booking that you are a repeat guest to get a special discount. Cabin was clean and we loved the area. We found what we were looking for. Everyone needed a break, a time to slow down and recharge. And that's what we got. 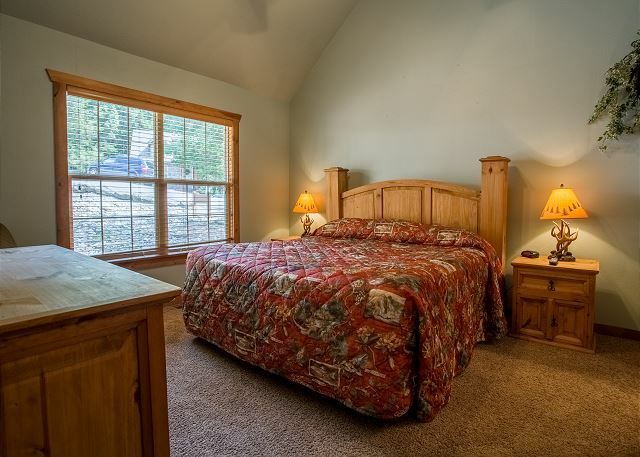 The cabin was perfect; the beds were comfy, the layout was great, and the cabin size was just right for the 4 of us. During the day, it was cool and roomy. Everything really worked well for us. There was plenty of hot water for showers, the screened in porch in the back was quite nice, and we had time to just sit back and enjoy the quiet (especially the lack of fireworks going off every second around the 4th). Our only complaint was the wifi - it wasn't very strong, and downloads were extremely slow, or not at all. We understood this is a problem for DSL, but we had hoped for better. But all in all, it was a relatively minor annoyance. Donna Maki-Millions of thanks for working with us and showing this property. Donna was professional, knowledgeable and expert.Thanks to Sunset Nightly Rentals for finding this property.we enjoyed our stay. Gated property need to get a parking pass at the gate for the first time. Thanks, Dominic. We're glad we could help! Come back soon! We enjoyed the cabin. Great rates. No neighbors because it was off season. I will say that renting a cabin spoils you from using hotels! Wonderful Cabin in Beautiful Setting! The family had a quick spring break getaway. This was THE spot! Great except for train noise. Cabin was very nice, the area was well maintained was a beautiful place to stay at in Branson. We've stayed at the Stonebridge location 3 of the last 4 years while in Branson. We always enjoy visiting Branson and my mother joined my wife and I for a few days as we helped her celebrate her 80th birthday. While it is not inexpensive, I feel it is a decent value. The PP cabin was very quiet and is especially nice when a cool front comes through allowing us to enjoy the screened porch overlooking a small creek and view of the golf course through the trees. The only complaints are minor, ie; the fire place was not prepared for operation so we couldn't use it during the cool nights. We were told we would get a $30 refund for the inconvenience so there's that. Also the entrance is pretty steep from driveway to front door and could be a hazard if wet or snowy or if you have elderly guests. It appears the concrete slabs have settled creating an exaggerated slope. Also, although operational, the kitchen glass top electric range appears to be a bit old as it showed signs of much wear. We also reported to the property manager that when we arrived there was a spot on the inside trim of the front door that was chewed up by a previous customer's pet. As I mentioned this is minor but for the money should be addressed. 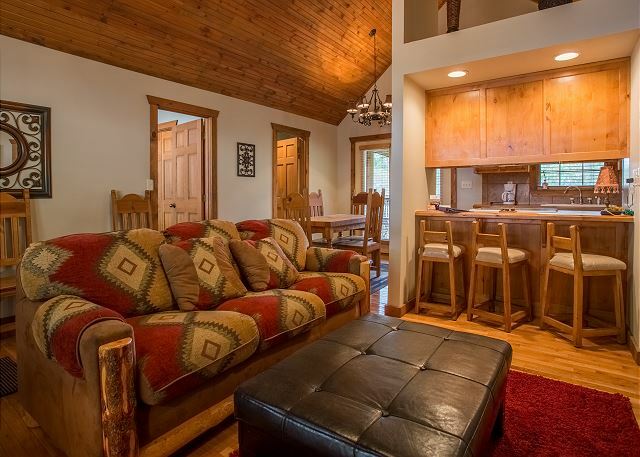 There are plenty of positives that made this cabin a really nice place to stay, ie; 2 bedrooms, 2 full baths with jacuzi tubs, 3 TV's with great programming, decent wi-fi, comfortable furniture and beds. 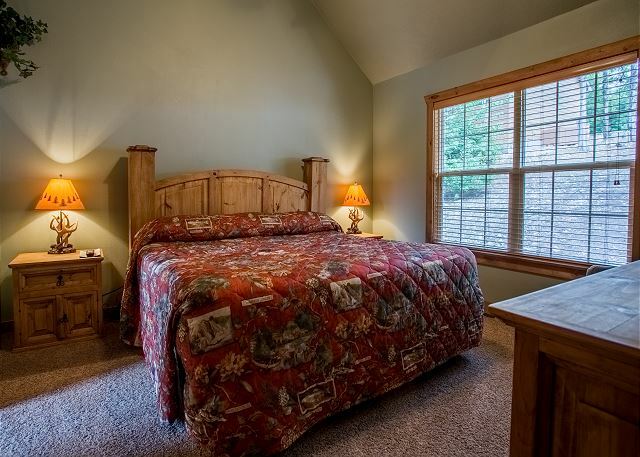 It is very quiet and comfortable and we would stay again depending on price. We had an excellent time visiting Branson and we absolutely loved our little cabin. It was in the perfect location and not far from all we set out to do. We will definitely be back! Hi, Shannon! Thanks for your feedback. We're so glad to hear you had a nice time at Peaceful Path Cabin, and we can't wait to hear from you in the future. Don't forget to mention your previous stay for a special returning guest discount on your next Branson vacation! Hi, Lisa! We're so glad to hear that you enjoyed Peaceful Path for your stay. 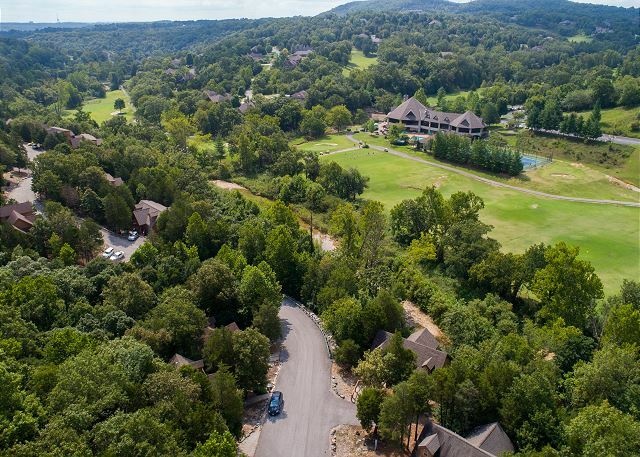 We can't wait to see you again, and when you're ready for your next Branson vacation, just let us know you're a returning guest for a special discount! We always LOVE staying in these cabins either on the lake or like this one on the creek. It was so peaceful and quite in the mornings listening to the water flowing. Perfect for two couples and our little 4 legged baby. The cabin was nice, clean, and a great place to relax after a day in Branson. We would definitely stay here again if we ever went to Branson again. Way better than staying in a hotel. I was very impressed with the customer service and communication. We did have an issue come up over the weekend which is why I can't give it a perfect 5 stars across the board. We were able to contact someone who could help us and they offered us reasonable solution options in a timely manner. The setup is perfect for 2 couples or a family. Our dog absolutely loved it there. There are cabins nearby, but it is very quiet. Very impressed with this cabin. I have stayed in many cabins and this one was so clean. Not even dusty around the base boards or hard to reach places. I have never seen that before. Easy to follow instructions and very nice area with playground / picnic area if you have children. I would definitely stay here again. We had an amazing stay at Peaceful Path Cabin in Stonebridge. 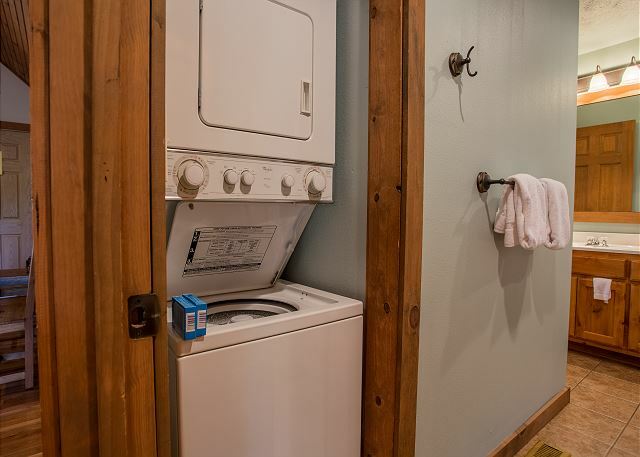 The property was extremely clean with just the right amenities. Sunset Nightly Rentals staff was very helpful in making sure we had the right cabin for our family, including the dachshunds. Top notch customer service!! We will be looking to book with Sunset Nightly Rentals in the future. 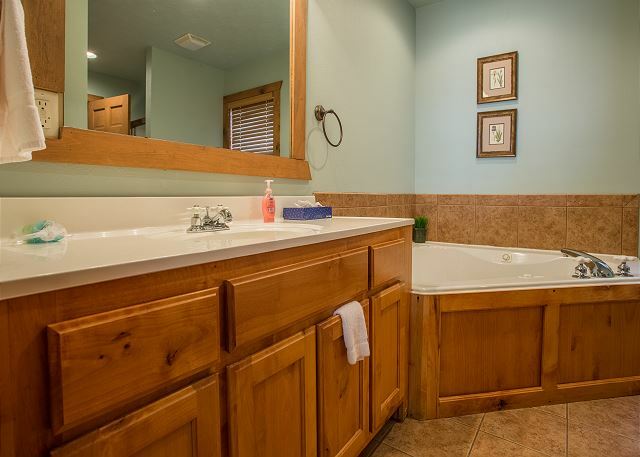 We would highly recommend this property to anyone visiting the Branson area. We enjoyed fishing in the stocked pond during our 3 day stay. Great cabin and great family vacation! We have 4 children ages 8 to 8 months and it was the perfect amount of space for us. Very clean and we loved the washer/dryer, screen porch, kitchen and living area. Bedroom and bathrooms were very spacious. We also enjoyed the neighborhood amenities such as the pool, creek, playgrounds and fishing ponds. The only thing that could be improved is for an outdoor grill to be closer, but oven and stove worked great! We would definitely stay there again! 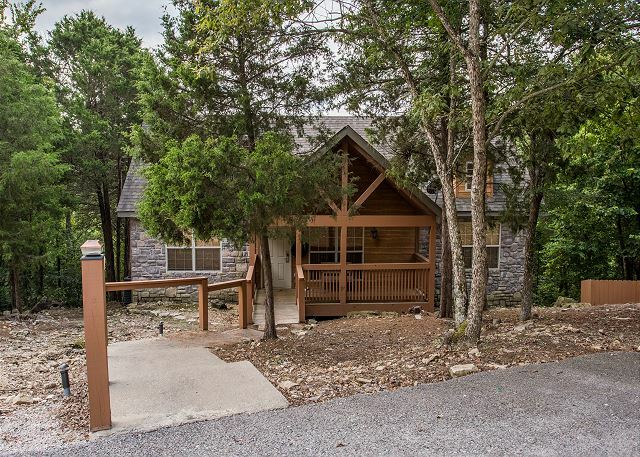 This cabin was the perfect place to call home while spending time in Branson. Very quiet neighborhood. Highly recommend.